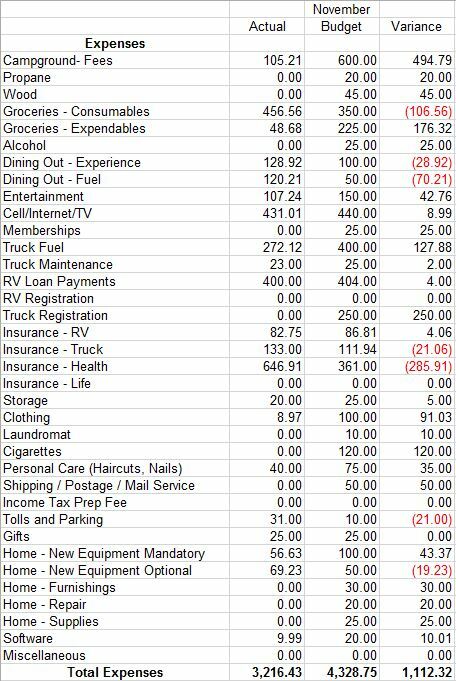 November was a really good month from an expense perspective with only $3,216.43 in expenses. It’s hard to spend money when you are working 10-12 hours a day. It actually would have been one of our best months ever, $2875.63, if we did not have to double pay our health insurance. We signed up for ACA for 2017 and had to pay the first month premium to get on the program. Details for all other items are listed below. Campground Fees – We spent $105 traveling from Montana to Texas in the first few days of the month. Groceries – We were under budget by $97. This was due to a concerted effort on our part to use what we already had in the pantry and the significantly lower cost of food in Texas. Dining Out – We were over between the two categories by about $100. A chunk of this was our one big splurge meal at the Big Texan, but also we tend to spend more on food when we are traveling. It has been tough not to completely blow this budget though. As hard as we are working it is tempting to order pizza or get fast food and more of that may happen in December, but in November we did pretty well. Truck Fuel – This was great at $172 under budget. The bulk of our spend was traveling to get here and we have used very little while here. We get reimbursed for one tankfull at the end so we will get some of this back. Truck Registration – I showed this as being due in November, but it’s actually in December. Home – The big purchase in this category was $50 in couplings and clamps so we could attach our sewer hose to the large portable tank they provided us for waste here. Not sure if we will ever use them again, but they were necessary. So it was a good month from an expense stand point at least. We will see if the trend continues. This entry was posted in Lakeside and tagged Fulltiming budget, RV Fulltiming Budget. Bookmark the permalink. Interesting as always. Lee, by the way, thanks for including my little ditty at the end of the RV Dreams 2015 video, but it only proves why it’s a good thing I didn’t try and choose to do that for a living!